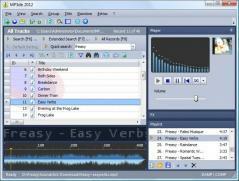 MP3db is a lightweight piece of software that makes it easy to organize and listen to your music files. Once you enter the MP3 search path, you can view the list of loaded songs along with related details. The imported music is sorted using various parameters and you can also create groups. You can add any item to a playlist via double-click, edit tags including extended ones such as copyright info, composer and conductor. MP3db also enables you to save configurations to re-use them as needed.